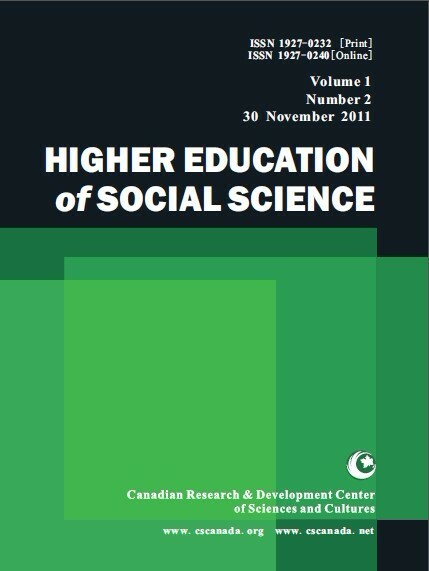 The journal Higher Education of Social Science (HESS) is a leading peer reviewed academic journal published monthly. The journal promotes the exchange of ideas and rational discourse between practicing educators and educational researchers in social science aspect and contributes to the understanding and/or improvement of educational processes and outcomes. The Journal aims to serve the needs of faculties, researchers, administrators and those concerned with the present and future of higher education. This Journal also encourages discussion about higher education at the perspective of social science within and among relevant professional and academic communities and researchers at social science level. Articles will combine phenomenon analysis, development of higher education, discussion of education method and other issues which are important to faculty, administrators, and program managers. Higher Education of Social Science (HESS) is filed by Library and Archives Canada, and collected by the database AMICUS of Canada, indexed by ProQuest LIC.,. Gale, EBSCOPublishing, Ulrich's of America, indexed by CNKI of China, indexed by Open Access of Germany, etc..
1. The manuscripts are required to be written in English, and they should be submitted to hess@cscanada.net or hess@cscanada.org. The preferred format is MSWord. 5. The copyright of the articles goes to the authors, while HESS owns the first publishing right. 6. As for the publication fees, 20% of the articles are free, on the basis of assessment results given by our editorial team. Excellent articles will be published with no charge, but others will not.